As recently noted, I decided to give the two new starters, Wally and PJ, a little bit of a competition and threw my standard starter, Carl of Oregon (a purchased starter that originated in 1800’s), into the mix to basically see which, if any, was the best of the lot. Just to explain, Carl, regardless of his ‘roots’ has been an active starter in my house for well over a year so has had plenty of time to become mature. So he’s up against two “new kids”. Now I didn’t get into the usual step-by-step photo thing for this post because it was actually a little too hectic keeping track of everything. I basically had to mix three different batches of dough each with it’s own starter. 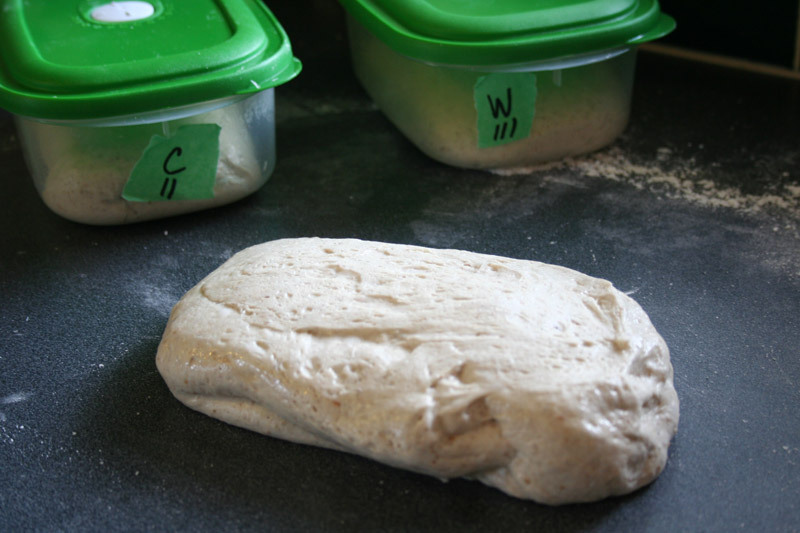 I also decided this would be a good time to work up the next BBA Challenge bread: Kaiser Rolls. So last night I set up the levain build, as per Hamelman’s instructions, but with a distinct change: I took the recipe and divided everything by three. 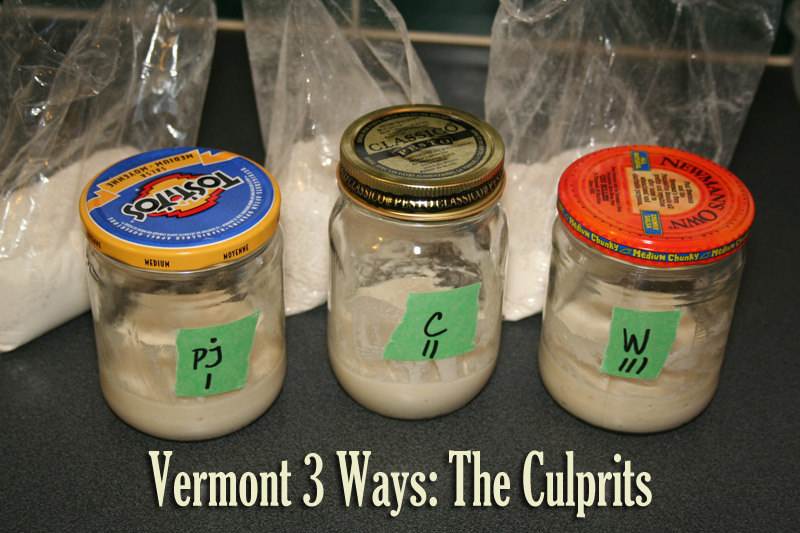 So into each jar I made 1/3 of the levain ingredients but using PJ, Wally and Carl in each. Those got set aside for the night while I worked on the poolish for the Kaisers. 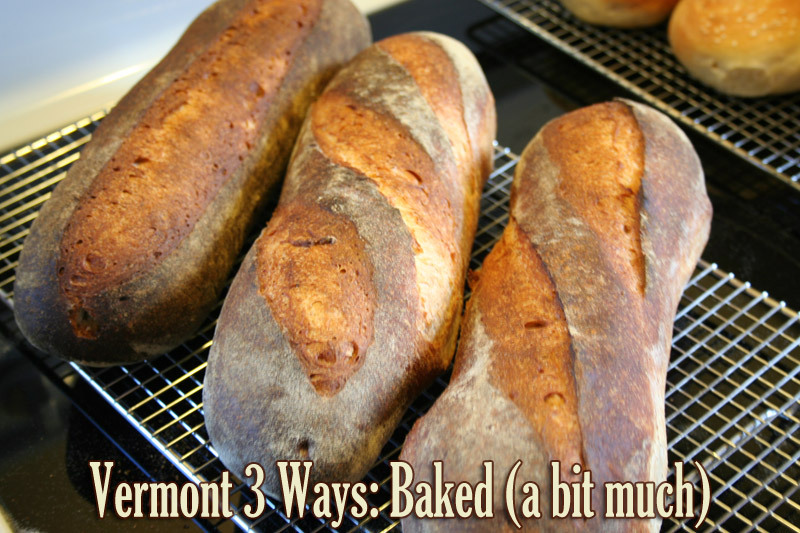 After a night of building up the levain, I then followed the recipe, a noted, divided in thirds. The bags you see behing the starter jars are the pre-measured amounts of dry stuff. These went into the mixer bowl along with the required water and staer, mixed to a shaggy stage then allowed to autolyse for about 30 minutes. 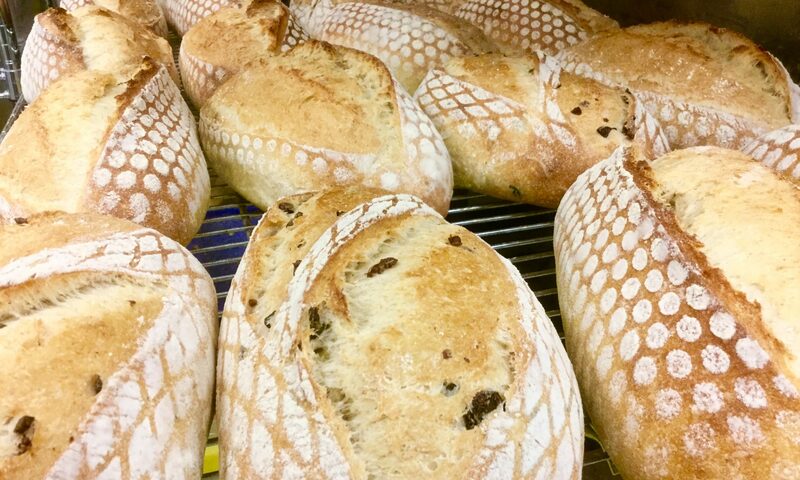 They are then mixed a bit longer, put into the tubs shown above and allowed to bulk ferment for 50 minutes then get a stretch and fold. Repeat after 50 minutes then a last 50 minute ferment. At that point, they’re ready to shape, which is where that left side pic is at. Once shaped, they’re placed into the couche and allowed to proof for two.5 hours. 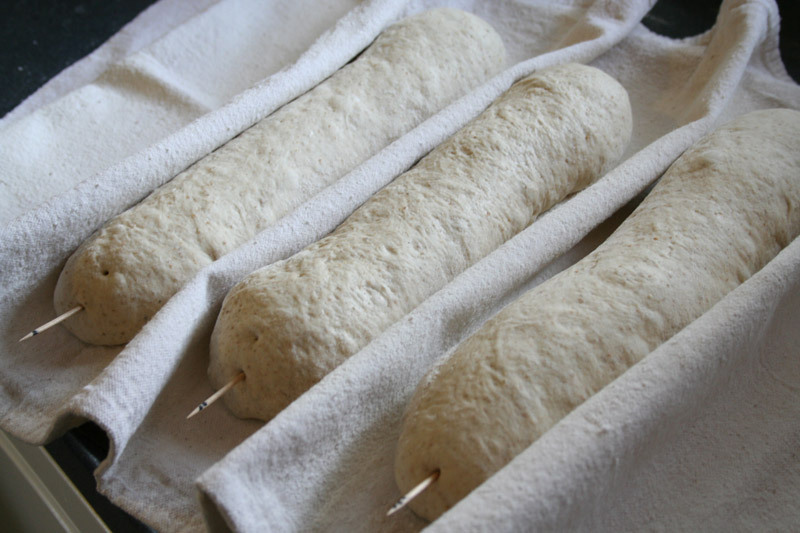 In order to know what loaf is what starter, I poked a toothpick into the ends and put a mark on it, as shown at left. Once the loaves had risen, they were slashed – the three are above, different slashes for each. That was probably a mistake. This caused the loaves to develop in the oven a little differently and now I won’t know if the different expansion will be because of the starter or the slashing. Oh well, what’s done is done. So in the above photo, we have Carl on the left, Wally in the center and PJ on the right. Inot the 460º oven they went for, says the book, 40-45 minutes. They got steamed for the first bit as well. And there’s the result. A little overdone; I had the convection on at the beginning, forgot to turn it off after preheating the oven. So the crust is a bit too dark and this, hopefully, won’t affect the overall experiment too much. They’re all too dark, after all. Edit: Turns out it’s mostly the end nubs that got really overdone. Once past that, the crust is OK although I would have liked it a little lighter. Once these are cooled, I’ll do a taste test and try to see if there’s any difference between PJ and Wally, save for PJ having been an easier starter to get going. I expect neither PJ or Wally will be much different from each other, flavour or texture wise. Cooled, sliced and tasted. Which one came out best? Well, they all rose about the same, in other words “quite well”. 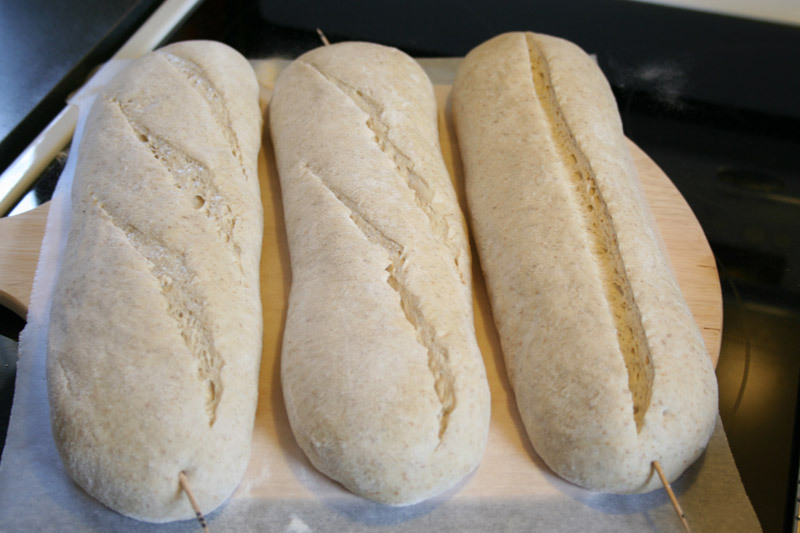 The crumb is similar for al three loaves. So it’s down to flavour. The two new starters had a very slight edge over the old Carl, a little more distinct aroma, not extreme at all but decidedly there. They are all about the same on the “sour” level, none displayed a more acid tone. All three are quite good. The fact the new guys manage to develop a bit more flavour puts them over Carl. Now granted they weren’t retarded, I went with the 2.5 hour proof. I suspect that had I done the full development, that flavour would be a little more distinct. Keeping in mind the main purpose of this project was to see how easy it is to start a starter and that using pineapple juice bipasses a few days and potential “bad guy bateria”problems, this last test is really just for curiosity’s sake than anything else. Still, I’m glad I did it because it does show thaere si now a better starter for me ot focus on. Carl gets beaten by the new twins by a slight flavour margin, while both the new starters are pretty much identical. If I was given a slice from both loaves, I’d be unable to say there’s any discernible difference. So the outcome is that the pineapple vs water starter difference is strictly in how easy it is to get the starter going without wading through The Stink and you shave a few days off the start-up process. And you get to drink the rest of the pineapple juice after you’ve fed your starter all it needs. When I make this bread again, I’ll go all the way and do the full 12-16 hr cold ferment and really try to pull that flavour out of the starter. But at this point, I’m going to reduce the starter collection to just one (I’ll mix Wally and PJ together which means I’ll have to give this new mix with a new name) and dry up Carl to save as back-up. Now, I got some serious bread eatin’ to do. I really enjoy your blog and appreciate all the effort you put in to taking such excellent photos and putting it all together for a step-by-step description of each recipe/experiment. I, too, used the pineapple juice method to create my starter and it’s still going strong in the fridge after much abuse (not on purpose, of course). I’m curious as to what schedule you are planning on using for the refrigerated starter… this is always one area where I get confused and would like to compare notes. I usually refresh on wednesday at 1:2:2, leave on the counter for about 4-6 hours then place in fridge. Friday night I’ll take enough from the mother to make levain for saturday bread. Back in the fridge until wednesday when it gets refreshed. My feeding schedule is typically to feed ~weekly, on either Friday or Thursday so that the “excess” can be used in a bread I make over the weekend. It would depend on the expected bread, if the starter needed to be increased (say to 300+g) from the excess of about 40g I’d otherwise discard or put aside for other baked stuff (i.e. pancakes, etc.). I go with the 1:2:2 ratio, specifically 10g:20g:20g [S:W:F] as I feel this give the beasties plenty of food to play in and eat. I think 1:1:1 may be just a little too little and they’ll peak that amount much faster. I’ve seen contradicting info on how best to feed that cold starter. Some sources say take it out and let it warm up, reduce then feed and let it stay out for a couple of hours, put back in the fridge when it’s showing a fair bit of expansion BUT well before it peaks. Letting your guys get started on the fresh food at room temp before they get cooled off assures less disruption to their cycles even if they spend the next while living in slow-mo. Or so they say. This is the method I’ve been using. Why? Because it seems a good, middle-of-the-road way to go. Another school says feed and put back into the fridge right away; the yeasties are slowed down, not stopped, and they’ll sloooooowly munch through their fresh food. Again, some say this mucks up the yeast/lacto balance. Yet another method suggests waiting until the starter peaks before putting it in the fridge. This strikes me as a bit illogical. The slowed down beasties are then overcrowded and won’t see any fresh food for ages (by their watch) even tough their activity is slowed down. So they’ll be spending the next however-many-days they think they’re going through hungry. Then there’s the added dimension of letter the starter warm up for a few hours vs feeding it with warm water fresh out of the fridge… many variations. As in MANY aspects of starter culture, there are a lot of different theories and most of them are left to “do what YOU think works best”. Which basically leaves most of us just flailing about and just hoping we’re not doing more harm than good to our starter. I’m no microbiologist, so what I “think” works best may be wrong and stopping my starter from producing the results I actually want. I’d like a tangier starter – or bread anyways – is my particular feeding system helping or hindering that? I dunno. Maybe what I’m doing is stunting the lacto and they can’t deliver the acid tones I want when they get thrown into a levain. This is a topic for a whole ‘nuther post, as you can tell. Or more like a discussion even. I should probably fire up a forum I’ve got hiding in the back room here and see if people are up to discussing issues like this or even wants to participate on any level. Thanks for the thought-provoking reply Paul… I’m always open to trying different methods am also in search of a more sour starter/bread. One concept that seems very controversial is the hydration of the starter… I think I remember seeing contrasting information about this in 2 of Peter Reinharts books. This would be an excellent discussion topic or experiment!! 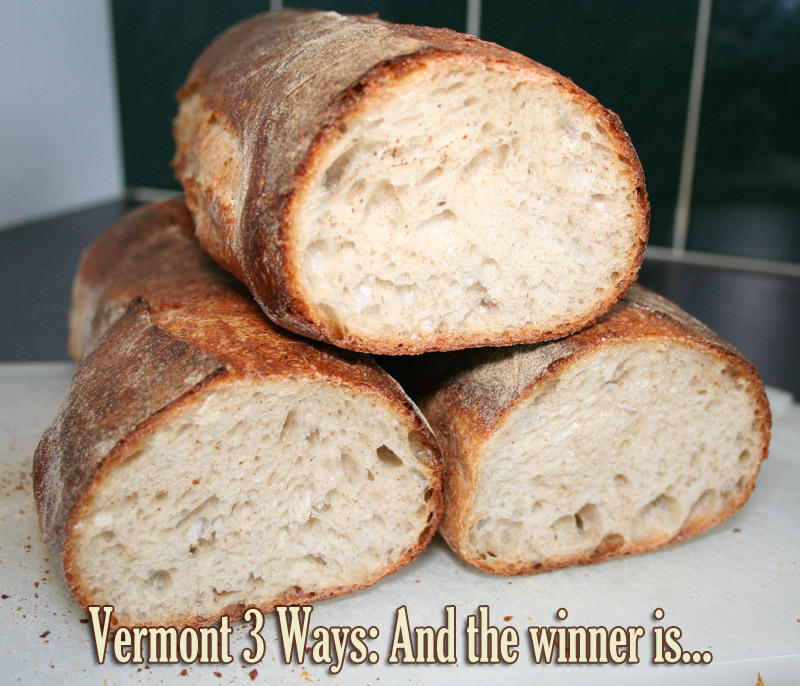 I very recently got Bread by Hammelman and a KA mixer so I’ll be making the Vermont Sourdough in the next few weeks and hopefully I’ll be able to add to the discussion… I look forward to your next blog! I am up to day five of my pineapple juice starter. No signs of the death that befell my BBA barm. I have a few questions. Did you let Carl live in the refrigerator or do you just keep your starters on the counter? When you reach the point where you are happy with the starter, how often do you feed it? This would be where I lost my old starter, neglected, unfed. How do you think it all got started? Who decided to bake bread out of the the stinky mixture on the counter? And finally, do you always turn off the convection in your oven. I have been cooking with it on and haven’t noticed any issues. Thanks for posting your starter writeup. I am having fun with it. Glad to hear your baby starter is doing well, it will hopefully start activating shortly! Carl and Audrey2 (the Other other starter) live(d) in the fridge as they were both mature enough to do so. Carl was built from dried starter so he didn’t actually have much of a “youth” other than the day or two when he was rehydrated. Up to now, Wally and PJ have been living on the counter (Carl too for the last three days to get ready for the Three Way bake). But they’ve been out and fed steady for three full weeks. They could stay out for a couple more weeks to mature a little more but they can certainly go to the fridge at this point. That just means it will be a couple of months of weekly feeds before they really get to their “real” characters. I’m OK with that as it means not having to feed them quite so much. I would add that “they” are now mixed together into one starter since this last experiment showed them to pretty much be identical anyway, there was no point keeping them separate. So now I have a new, combined starter which I haven’t named yet. He/she/it will get the same feeding schedule as I describe in the comment above to Adam. Who started this? Who knows, it one of those questions like “who invented the wheel?” Until someone has a time machine to go back and watch the “Aha!” moment then ask that person their name, we’ll just never know. But it happened a whole lot longer than before there were “kitchen counters” and most likely by accident when someone may have left their plain flour and water dough in a pot, came back to it a few days later and found it all bubbly. I actually never bake with the convection on, I only use it as part of the pre-heat feature (fast preheat) but I just forgot to turn it off. I haven’t found enough info on how to use it yet, it needs a lower temp and shorter bake time and I don’t know what that calculation is or how to adjust a “normal” bread recipe. Let us know when your starter hits the next stage! I bake convection on all the time, just lower the temp 50 degrees. Reinhart writes about convection ovens somewhere in the book. Anything to cut down on the baking time while it is 100 degrees here. I wrote about your blog, an homage to your starter understanding. I’m going to use some this weekend and try the bizarre russian rye the bread baking babes have been blogging about. The bizarreness of the recipe intrigues me.